December 11, 2013 by Fr. C.
From time to time, we will attempt to do a bit of teaching here in the Cathedral Close. I was involved in a discussion last evening with a young student of Byzantine art who asked me what I thought my parishioners might know about the “orans position.” I could offer no opinion, but thought I thought I’d jot a note on the topic for the benefit of our vast readership. The ancient monuments of Christianity, such as the tombs in the catecombs, often show someone in the Orans position, arms extended and palms forward, supplicating God, to show that the prayers of the Church accompany the person in death. 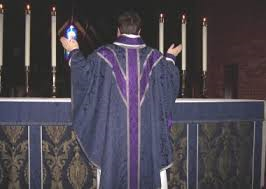 The liturgical use of this position by the priest indicates he is praying on behalf of the people, acting as alter Christus as pastor of the flock, head of the body. Some modern rubrics now say only, that the priest “extends his hands” or “with hands extended.” Priests understand (or should understand) what is meant from observation and training, and although there is some variability between priests basically the same gesture is obtained from all of them.